The Raid on Dartmouth (also referred to as the Dartmouth Massacre) occurred during Father Le Loutre's War on May 13, 1751 when a Mi'kmaq and Acadia militia from Chignecto, under the command of Acadian Joseph Broussard, raided Dartmouth, Nova Scotia, destroying the town and killing twenty British villagers and wounding British regulars. The town was protected by a blockhouse on Blockhouse Hill (close to corner of King St. and North St.) with William Clapham's Rangers and British regulars from the 45th Regiment of Foot. This raid was one of seven the Natives and Acadians would conduct against the town during the war. 45th Regiment of Foot was stationed in Dartmouth during the Raid. Despite the British Conquest of Acadia in 1710, Nova Scotia remained primarily occupied by Catholic Acadians and Mi'kmaq. To prevent the establishment of Protestant settlements in the region, Mi'kmaq raided the early British settlements of present-day Shelburne (1715) and Canso (1720), prior to entering into a Peace and Friendship Treaty with the British in 1726. A generation later, Father Le Loutre's War began when Edward Cornwallis arrived to establish Halifax with 13 transports on June 21, 1749. By unilaterally establishing Halifax, the Mi'kmaq believed the British were violating earlier treaties (1726), which were signed after Father Rale's War. By the time Cornwallis had arrived in Halifax, there was a long history of the Wabanaki Confederacy (which included the Mi'kmaq) protecting their land by killing British civilians along the New England/ Acadia border in Maine (See the Northeast Coast Campaigns 1688, 1703, 1723, 1724, 1745, 1746, 1747). The British quickly began to build other settlements. To guard against Mi'kmaq, Acadian and French attacks on the new Protestant settlements, British fortifications were erected in Halifax (Citadel Hill) (1749), Bedford (Fort Sackville) (1749), Dartmouth (1750), Lunenburg (1753) and Lawrencetown (1754). There were numerous Mi'kmaq and Acadian raids on these villages such as the Raid on Dartmouth (1751). There was a raid on those in the Dartmouth area in 1749 (See Raid on Dartmouth (1749)). In response to the raids, Governor Edward Cornwallis offered a bounty on the head of every Mi'kmaq. The British military paid the Rangers the same rate per scalp as the French military paid the Mi'kmaq for British scalps. As well, to carry out this task, two companies of rangers were raised, one led by Captain Francis Bartelo and the other by Captain William Clapham. These two companies served alongside that of John Gorham's company. The three companies scoured the land around Halifax unsuccessfully looking for Mi'kmaq. In July 1750, the Mi'kmaq killed and scalped 7 men who were at work in Dartmouth. In August 1750, 353 people arrived on the ship Alderney and began the town of Dartmouth. The town was laid out in the autumn of that year. The following month, on September 30, 1750, Dartmouth was attacked again by the Mi'kmaq and five more residents were killed. In October 1750 a group of about eight men went out "to take their diversion; and as they were fowling, they were attacked by the Indians, who took the whole prisoners; scalped ... [one] with a large knife, which they wear for that purpose, and threw him into the sea ..."
In March 1751, the Mi'kmaq attacked on two more occasions, bringing the total number of raids to six in the previous two years. 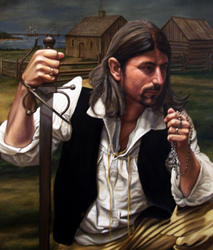 Joseph Broussard, known as "Beausoleil"
Three months later, on May 13, 1751 before sunrise, Broussard led sixty Mi'kmaq and Acadians to attack Dartmouth again, in what would be known as the "Dartmouth Massacre". The raiding party came down the Shuebenacadie River from Chignecto. Broussard and the others killed twenty settlers and more were taken prisoner. Captain William Clapham and sixty soldiers of Hugh Warburton's regiment were on duty and fired from the blockhouse, which was located at the point overlooking Dartmouth Cove. The raiding party tortured and mutilated the sergeant and wounded three other soldiers. Captain Alexander Murray along with about 40 soldiers left Halifax in three vessels and tried to track them down for miles but most of the raiding party had dispersed. The British reported they had killed six Mi'kmaq warriors, but were only able to retrieve one scalp that they took to Halifax. Those at a camp at Dartmouth Cove, led by John Wisdom, assisted the settlers. Upon returning to their camp the next day they found the Mi'kmaq had also raided their camp and taken a prisoner. The British retaliated by sending several armed companies to Chignecto. A few French defenders were killed and the dikes were breached. Hundreds of acres of crops were ruined which was disastrous for the Acadians and the French troops. Immediately after the raid, a wooden palisade was erected around the town plot. Mi'kmaq and Acadian attacks continued throughout the French and Indian War which ended fourteen years after Dartmouth was first settled. (For example, in the spring of 1759, there was another attack on Fort Clarence, in which five soldiers were killed.) After the initial raid, no new settlers were placed in Dartmouth again for the next thirty years. Of the 383 settlers who arrived in Dartmouth on the Alderney in August 1750, only half remained two years later. By the end of war (1763), Dartmouth was only left with 78 settlers. Similar raids happened in response to the British founding of Lawrencetown and Lunenburg, Nova Scotia, such as the Raid on Lunenburg (1756). Joseph Howe lived in Dartmouth and was well acquainted with its history. He included a Mi'kmaw raid on a British dewelling in his poem Acadia. In the poem, Mi'kmaw fighters attack a British family of four in their house. Initially, the British family is able to defend themselves, killing 5 Mi'kmaw fighters. Eventually, however, the Mi'kmaw fighters are victorious and overwhelm the family, killing all those in the house. Wilson, John (1751). A Genuine Narrative of the Transactions in Nova Scotia since the Settlement, June 1749, till August the 5th, 1751. London: A. Henderson et al. Landry, Peter. The Lion & The Lily. Vol. 1, Trafford Publishing, Victoria, B.C., 2007. Rompkey, Ronald. Editor. Expeditions of Honour: The Journal of John Salusbury in Halifax, Nova Scotia, 1749-53. University of Delaware Press, Newark, 1982. Harry Chapman. In the Wake of the Alderney. ^ a b Wilson (1751). ^ Murdoch (1866), p. 201, indicates there were 60 Mi'kmaq and Acadians. ^ The British officers only produced one scalp. The British reported the other five bodies were retrieved by the natives. More likely the British inflated the numbers of the enemy they killed to mitigate prosecution for their inaction during the raid. ^ Wilson (1751) reported that fifteen people were killed immediately, seven were wounded, three of whom would die in hospital; six were carried away and never seen again". ^ a b Wilson (1751), p. 16. ^ Scott, Tod (2016). "Mi'kmaw Armed Resistance to British Expansion in Northern New England (1676–1761)". Journal of the Royal Nova Scotia Historical Society. 19: 1–18. ^ Reid, John G.; Baker, Emerson W. (2008). "Amerindian Power in the Early Modern Northeast: A Reappraisal". Essays on Northeastern North America, Seventeenth and Eighteenth Centuries. University of Toronto Press. pp. 129–152. doi:10.3138/9781442688032. ISBN 978-0-8020-9137-6. JSTOR 10.3138/9781442688032.12. ^ Grenier, John. The Far Reaches of Empire. War in Nova Scotia, 1710-1760. University of Oklahoma Press, Norman, 2008. ^ Thomas Akins. History of Halifax, Brookhouse Press. 1895. (2002 edition). p 19; While the French military hired the Mi'kmaq to gather British scalps, the British military hired rangers to gather French and Mi'kmaq scalps. The regiments of both the French and British militaries were not skilled at frontier warfare, while the Mi'kmaq and Rangers were. British officers Cornwallis, Winslow, and Amherst both expressed dismay over the tactics of the rangers and the Mi'kmaq.Grenier (2008), p. 152; Faragher (2005), p. 405; Hand, p.99). ^ Thomas Akins. History of Halifax, Brookhouse Press. 1895. (2002 edition). p 19; The first recorded encounter between the Mi'kmaq and these rangers happened on March 18, 1750 in the Battle at St. Croix. ^ For the two raids that happened in March 1751 see Grenier (2008), p. 160. ^ Pote, William (1896). The Journal of Captain William Pote, Jr., during his Captivity in the French and Indian War from May, 1745, to August, 1747. New York: Dodd, Mead & Company. p. 52. ^ Wilson (1751), p. 17. ^ See anonymous private letter printed by Harry Chapman, p. 30. ^ Wilson (1751); Harry Chapman, p. 29; Douglas William Trider list the 34 people who were buried in Halifax between May 13 - June 15, 1751. Four of whom were soldiers. (See History of Halifax and Dartmouth Harbour: 1415-1800. vol. 1, p. 69). ^ Faragher (2005), p. 272. The Attack at Mocodome (present-day Country Harbour, Nova Scotia) occurred during Father Le Loutre's War on February 21, 1753, when two English died and six Mi'kmaq. The battle ended any hope for the survival of the Treaty of 1752 signed by Governor Hobson and chief Jean-Baptiste Cope. The Battle of Bloody Creek was fought December 8, 1757, during the French and Indian War. An Acadian and Mi'kmaq militia defeated a detachment of British soldiers of the 43rd Regiment at Bloody Creek (formerly René Forêt River), which empties into the Annapolis River at present day Carleton Corner, Nova Scotia. The battle occurred at the same site as a battle in 1711 during Queen Anne's War. The Battle of Falmouth was fought at Falmouth, Maine when the Canadiens and Wabanaki Confederacy attacked the English New Casco Fort. The battle was part of the Northeast Coast Campaign (1703) during Queen Anne's War. The Battle of Petitcodiac was fought during the Bay of Fundy Campaign (1755) of the French and Indian War. The battle was fought between the British colonial troops and Acadian resistance fighters led by French Officer Charles Deschamps de Boishébert on September 4, 1755 at the Acadian village of Village-des-Blanchard on the Petitcodiac River (present-day Hillsborough, New Brunswick, Canada). The Battle of Port La Tour occurred on July 18, 1677, at Port La Tour, Acadia as part of the Northeast Coast Campaign during the First Abenaki War (the Maine-Acadia theater of King Phillips War) in which the Mi'kmaq attacked New England fishermen. The New Englanders eventually overwhelmed them and many Mi'kmaq were enslaved. The Charitable Irish Society of Halifax is a historic society in Halifax, Nova Scotia which was established in 1786. The Society assists those on low-income and holds other charitable events. Many of the most prominent members of Nova Scotia have been members of the Society. Dartmouth ( DART-məth) is a former city and urban community located in the Halifax Regional Municipality of Nova Scotia, Canada. Dartmouth is located on the eastern shore of Halifax Harbour. Dartmouth has been nicknamed the City of Lakes, after the large number of lakes located within its boundaries. On April 1, 1996, the provincial government amalgamated all the municipalities within the boundaries of Halifax County into a single-tier regional government named the Halifax Regional Municipality (HRM). Dartmouth and its neighbouring city of Halifax, the town of Bedford and the Municipality of the County of Halifax were dissolved. The city of Dartmouth forms part of the urban core of the larger regional municipality and is officially designated as part of the "capital district" by the Halifax Regional Municipality. At the time that the City of Dartmouth was dissolved, the provincial government altered its status to a separate community to Halifax; however, its status as part of the metropolitan "Halifax" urban core existed prior to municipal reorganization in 1996. Dartmouth is still an official geographic name that is used by all levels of government for legal purposes, postal service, mapping, 9-1-1 emergency response, municipal planning, and is recognized by the Halifax Regional Municipality as a civic addressing community. The official place name did not change, due to the confusion with similar street names, land use planning set out by the former "City of Dartmouth," and significant public pressure. Today the same development planning for Downtown Dartmouth and the rest of the region is still in force, as well as specific bylaws created prior to April 1, 1996. Halifax Treaties were 11 written documents signed by the various bands of the Mi’kmaq and the British in Halifax, Nova Scotia between 1760 and 1761. The Treaties ended the conflict that had persisted between the two peoples for 85 years. The Treaties include both military submissions, or oaths of allegiance made at the three fortresses in the region followed by treaties signed at Halifax, as well as the oral promises made during Treaty ceremonies to guarantee the Mi'kmaq the protection and rights as British subjects. The ceremony with the most primary sources was the Burying the Hatchet ceremony, which happened on 25 June 1761. While most historians have concluded that the language of the Treaties clearly reflect that the Mi'kmaq surrender to the British, other historians have suggested otherwise. Dartmouth founded in 1750, is a Metropolitan Area and former city in the Canadian province of Nova Scotia. Dartmouth and the neighbouring metropolitan area of Halifax form the urban core of the Halifax Regional Municipality (HRM). Both cities, along with the town of Bedford and the Municipality of the County of Halifax were dissolved on April 1, 1996 when they were amalgamated into HRM. John Connor (1728–1757) was a mariner who ran the first ferry in Halifax Harbour, Nova Scotia, and was involved in the Attack at Mocodome during Father Le Loutre’s War, which effectively ended the Treaty of 1752.Connor arrived unaccompanied on the Merry Jacks in 1749 with Edward Cornwallis. He later moved to Dartmouth. Mi'kmaw oral tradition indicates that Connors pregnant wife Mary and daughter Martha were killed in the Raid on Dartmouth (1751). In February 1752, by the order of the Nova Scotia Council, Connor established the first ferry in Halifax Harbour by the order of the Nova Scotia Council. On 22 December 1752 he assigned his ferry operation to two other mariners.He was later involved in the attack at Mocodome. Connor reported he killed the Mikmaq to escape captivity. He did not kill them for a bounty because there was no bounty at the time of the attack. Mi'kmaw oral tradition suggest that his involvement in the Attack at Mocodome was an act of revenge for the killing of his family in Dartmouth. The July 1752 census indicates that John Connor was living within the town of Halifax with two adult males (his sons?) and one adult female (his wife? ).On 16 December 1757, Connor died during the French and Indian War at age 29 and was buried at the Old Burial Ground. John George Pyke (4 January 1744 – 3 September 1828) was an English-born merchant and political figure in Nova Scotia. He represented Halifax County from 1785 to 1799 and Halifax Township from 1799 to 1800 and from 1802 to 1818 in the Nova Scotia House of Assembly. He also became head of the Police department. He survived the Raid on Dartmouth (1751) but his father Abraham did not. List of conflicts in Canada is a timeline of events that includes wars, battles, skirmishes, major terrorist attacks, riots and other related items that have occurred in the country of Canada's current geographical area. A complete list of terrorist attacks can be found at list of terrorist attacks in Canada. The Lunenburg Campaign was executed by the Mi'kmaq militia and Acadian militia against the Foreign Protestants who the British had settled on the Lunenburg Peninsula during the French and Indian War. The British deployed Joseph Gorham and his Rangers along with Captain Rudolf Faesch and regular troops of the 60th Regiment of Foot to defend Lunenburg. The Campaign was so successful, by November 1758, the members of the House of Assembly for Lunenburg stated "they received no benefit from His Majesty's Troops or Rangers" and required more protection. Acadian militias were units of Acadian part-time soldiers who fought in coordination with the Wabanaki Confederacy (particularly the Mi'kmaq militias) and French forces during the colonial period, to defend Acadia against encroachment by the English (the British after 1707). Some other Acadians provided military intelligence, sanctuary, and logistical support to the resistance movement. (And other Acadians remained neutral in the contest between the French–Wabanaki Confederacy forces and the British.) The Acadian militias achieved effective resistance for more than 75 years and through six wars before their eventual demise. According to Acadian historian Maurice Basque, the story of Evangeline continues to influence historic accounts of the deportation, emphasising neutral Acadians and de-emphasising those who resisted the British. While Acadian militia was briefly active during the American Revolution, the militias were dormant throughout the nineteenth century. After confederation, Acadians eventually joined the Canadian War efforts in World War I and World War II. The most well-known colonial leaders of these militias were Joseph Broussard and Joseph-Nicolas Gautier. The Raid on Chignecto occurred during King William's War when New England forces from Boston attacked the Isthmus of Chignecto, Acadia in present-day Nova Scotia. The raid was in retaliation for the French and Indian Siege of Pemaquid (1696) at present day Bristol, Maine. In the English Province of Massachusetts Bay. Colonel Benjamin Church was the leader of the New England force of 400 men. The raid lasted nine days, between September 20–29, 1696, and formed part of a larger expedition by Church against a number of other Acadian communities. The Siege of Grand-Pré happened during Father Le Loutre's War and was fought between the British and the Wabanaki Confederacy and Acadian militia. The siege happened at Fort Vieux Logis, Grand-Pré (present-day Hortonville, Nova Scotia). The native and Acadia militia laid siege to Fort Vieux Logis for a week in November 1749. One historian states that the intent of the siege was to help facilitate the Acadian Exodus from the region. This timeline of the History of the Halifax Regional Municipality documents all events that had happened in Halifax, Nova Scotia, Canada, including historical events in the former city of Dartmouth, the Town of Bedford and Halifax County. Events date back to the early-18th century and continue until the present in chronological order. In this timeline, the name Halifax refers to former city of Halifax in events listed before 1996. The Treaty of Watertown, the first foreign treaty concluded by the United States of America after the adoption of the Declaration of Independence, was signed on July 19, 1776, in the Edmund Fowle House in the town of Watertown, Massachusetts Bay. The treaty established a military alliance between the United States and the St. John's and Mi'kmaq First Nations in Nova Scotia - two of the peoples of the Wabanaki Confederacy - against Great Britain for the early years of the American Revolutionary War.Three years later, on 7 June 1779, the Mi'kmaq "delivered up" the Watertown treaty to Nova Scotia Governor Michael Francklin and re-established Mi'kmaw loyalty to the British. After the British resounding victory over the American Penobscot Expedition, according to Mi'kmaw historian Daniel Paul, Mi'kmaq in present-day New Brunswick renounced the Watertown treaty and signed a treaty of alliance with British on 24 September 1779. William Clapham (Clappan) was a Captain in the British Army who was stationed in Nova Scotia during Father Le Loutre's War. He was appointed captain in Boston in 1747 and sent to defend Annapolis along with Jedidiah Preble and Benjamin Goldthwait. After the Raid on Dartmouth (1749), Clapham raised a company of 70 men to fight the Mi'kmaq. Clapham relieved Gorham in the Battle at St. Croix. He was involved in the Battle at Chignecto.The first raid on Halifax happened in October 1750, while in the woods on peninsular Halifax, Mi'kmaq scalped two British people and took six prisoner: Edward Cornwallis' gardener, his son, and Captain William Clapham's book keeper were tortured and scalped. The Mi'kmaq buried the son while the gardener's body was left behind and the other six persons were taken prisoner to Grand Pre for five months.Ezekiel (Eziekiel) Gilman abandoned the saw mill in the wake of the Raid on Dartmouth and Clapham took charge of it. In the Raid on Dartmouth (1751), Captain Clapham and his company of Rangers were stationed on Blockhouse hill. He and the company are reported to have remained within the block-house firing from the loop-holes during the whole raid. A court martial was called on 14 May, the day after the raid, to inquire into the conduct of the different commanding officers who allowed the village to be destroyed. By June, Clapham's Sergeant had been acquitted.In the same year, Clapham was tried for killing a prisoner after having gagged him too tightly.